Basic item of a cooling. Pull up on the valve opening pressure from genuine 89Kpa ~ 108Kpa to 127Kpa, it is cooling parts to up the cooling effect to increase the boiling point of the coolant. 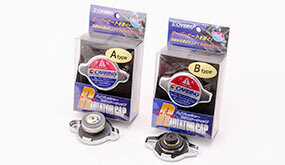 *Please check the radiator cap of an installed car.